This is a dragon painted by Mariusz Szmerdt. I love this painting. His work is very beautiful and detailed. In mounting this I wanted to think about cloths that would be both symbolically significant and make the artwork standout. 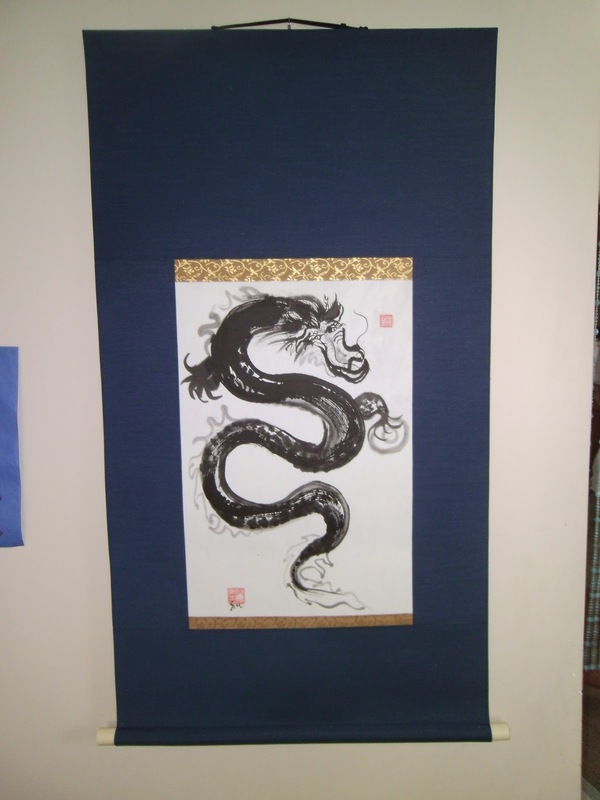 There is one phrase that I used from Chinese/Japanese folklore that is related to the dragon. Can you find the symbols in the cloths? 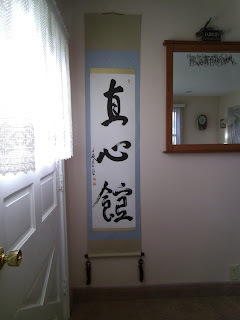 This was a scroll commissioned by an Aikido group in New York. One of their members did the calligraphy, and it is beautifully brushed. It reads Jikishinkan, which they translate as Direct Mind. They wanted this light blue cloth. They also selected brown glazed ceramic fuuchin to go along with the scroll. It came out beautifully. The scroll is finished with an ebony jikusaki and the Kodai San Iro hanging string. This is a scroll done for artist Susan Morningstar. Her sumi dragon is very informal but beautiful in the details of the ink painting. I originally did this in a minchou hyougu style scroll, but the customer did not like it and I redid in the Maru Hyougu style.